Buffalo Leather Bag the inspiration born through our admiration for unique handmade accessories for men and women across the globe. 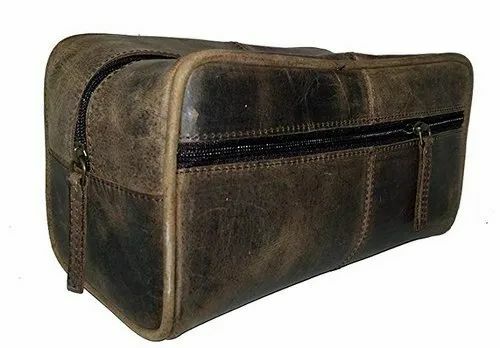 This bag is leather buffalo Hunter Toiletry bag. Inspired by Vintage designs this toiletry bag holds all you need to carry for those short trips and travels. The Metal zippers adds a rich and classy look to the kit and adds durability to the product. The Interior water resistant lining adds life to the leather.The external metal zipper adds grace to the look and is an easy way to store small items. This toiletry bag is all you need to carry your stuff in style . At leather we stand by our products and hope that you enjoy our products as much as we enjoy making them. We, Mangalmurtihandicrafts from 2017 are famous amongst the esteemed manufacturer of an exceptional quality assortment of Leather Diary and Jackets. Offered products range consists of Leather Diary, Leather Jackets, and Prastara Stylish Biker Leather Jacket. The offered range is designed using the only quality tested leather. Apart from this, these leather diary and jackets are known for their fine finishing, high strength, shrink and crack resistance, easy usability, and durability.